Dr. Louisa Uchum Egbunike is a lecturer in English at City, University of London. She has previously worked at Manchester Metropolitan University, SOAS and Goldsmiths, University of London. Louisa completed her PhD in African literature at SOAS, University of London, where she has also lectured in contemporary African literature. In 2016 she was selected as one of the BBC and the Arts and Humanities Research council’s ‘New Generation Thinkers’ which has seen her create and present content for BBC Radio 3 and BBC Arts Online. 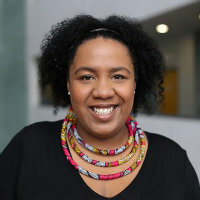 Louisa has published papers in academic journals, including African Literature Today and Matatu and has chapters published in the field of African literature in a number edited books including the recently published A Companion to Chimamanda Ngozi Adichie. She is currently working on a monograph on the Igbo-Nigerian novel and an edited book on the legacies of the Nigeria-Biafra war. She is also co-editing a journal special issues on the life and works of Buchi Emecheta for the Journal of the African Literature Association. Louisa has been an invited guest lecturer to a number of institutions including Wellesley College, The University of the West Indies, and The University of Bremen. She is currently working on a multifaceted project, which includes organising a series of conferences and workshops, curating a touring an art exhibition and producing a documentary film, which reflects on the legacies of the Nigeria-Biafra war. Louisa is one of the founders and conveners of the Annual International Igbo Conference at SOAS. Egbunike, L. (2017). Narrating the Past: Orality, History & the Production of Knowledge in the Works of Chimamanda Ngozi Adichie. A Companion to Chimamanda Ngozi Adichie (pp. 15–29). Boydell & Brewer. ISBN 978-1-84701-162-6. Egbunike, L.U. (2017). ‘On Intertextual Conversations: Images of the Igbo World in Akachi Adimora-Ezeigbo’s The Last of the Strong Ones and Chinua Achebe’s Things Fall Apart’. In Sackeyfio, R.A. and Diala-Ogamba, B. (Eds. ), Emerging Perspectives on Akachi Adimora-Ezeigbo (pp. 71–82). Lexington Books. ISBN 978-1-4985-5932-4. Egbunike, L. (2018). Set apart. TLS - The Times Literary Supplement, 2018-July(6015), p. 23. Egbunike, L. (2015). Re-Presenting Africa in Young Adult Speculative Fiction: The Ekpe Institution in Nnedi Okorafor’s Akata Witch. , 33, pp. 141–155. Egbunike, L.U. (2014). One-way traffic: Renegotiating the 'been-to' narrative in the Nigerian novel in the era of military rule. Matatu, 45(1), pp. 217–232. doi:10.1163/9789401211093_014 . Egbunike, L.U. (2013). Snapshots of the botswana nation: Bessie head's the collector of treasures & other botswana village tales as a national project. pp. 65–76. Egbunike, L.U. (2012). Constructing the Destructive City: Representations of Lagos in Cyprian Ekwensi’s People of the City. African Literature Today 30: Reflections and Retrospectives, (30), pp. 86–97.